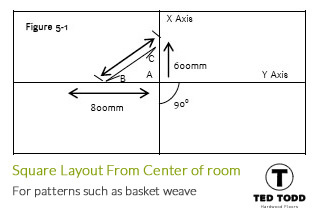 Panels or basket weave parquet can be laid wall to wall without centering the product in the room. The results will not be balanced but the products have no edge treatment to delineate the difference in sizes when unbalanced. More intricate patterns generally require the flooring to be centered. If the room dimensions allow, in at least two places from the corner, measure out and establish a chalk line parallel to and the width of 2 panels plus 13mm away from the starting wall opposite the entrance doorway. Measure and the width of 2 panels plus 13mm along Line Y from the right-angle wall and mark it Point A. From Point A, measure 800mm along Line Y and mark that Point B. From Point A, measure 600mm in the general direction of where line X will be and scribe an arc. From Point B measure 1000mm, scribing an arc that crosses Point C.
Verify all measurements before proceeding. Make any necessary adjustments to allow for walls out of square before proceeding.